Despite a first-round loss at the US Open, up-and-comer Julia Glushko says she’s proud to represent her adopted country – and looks forward to better results in the future. For many of the women in the main draw of the US Open, the path to the two-week tournament was straightforward. For Julia Glushko, an Israeli ranked 160th in the world, the road to her first-ever Grand Slam started many months ago — and ended triumphantly last week, with victories in three tough qualifying matches. Once at the Open, the 22-year-old’s experience proved a bit of an anticlimax — the Ukrainian-born player put up a tough fight Monday, but lost 7-5, 6-2 in her first-round match against the No. 25 seed, Yanina Wickmayer of Belgium. Despite the disappointing result, Glushko views her participation as a reason for celebration, capping off an extraordinary year of growth for the Modiin resident. In December, Julia (pronounced “Yulia”) won the Israeli national title by defeating Shahar Pe’er, ending the latter’s five-year reign as champion. The victory kicked off a 2012 of tournaments around the world, including the biggest singles title of Glushko’s career: a July win at an International Tennis Federation tournament in Louisville, Ky.
Glushko’s US Open appearance was scheduled as the third match of the day, but due to a 2½ -hour rain delay, she didn’t set foot on the court until 7 p.m., when spectators were arriving for a night session featuring Kim Clijsters, Roger Federer and a music performance by “American Idol” winner Jordin Sparks. Wearing tennis whites and a bandage on her left knee, Glushko hit strongly off both her forehand and backhand. Even with her relatively low ranking, members of the crowd clearly knew who she was, chanting words of encouragement — “yallah” (let’s go) and “kadima” (come on) — familiar to any Israeli. “I am so thankful that people came out—there were a lot of Jewish and Israeli people cheering for me,” said Glushko, who’s fluent in Hebrew, Russian and English. Beyond her first Grand Slam experience — following a failed January attempt to qualify for the Australian Open — Glushko’s trip to New York also meant a chance to reunite with her former doubles partner, the Israeli-Arab player Nadine Fahoum. 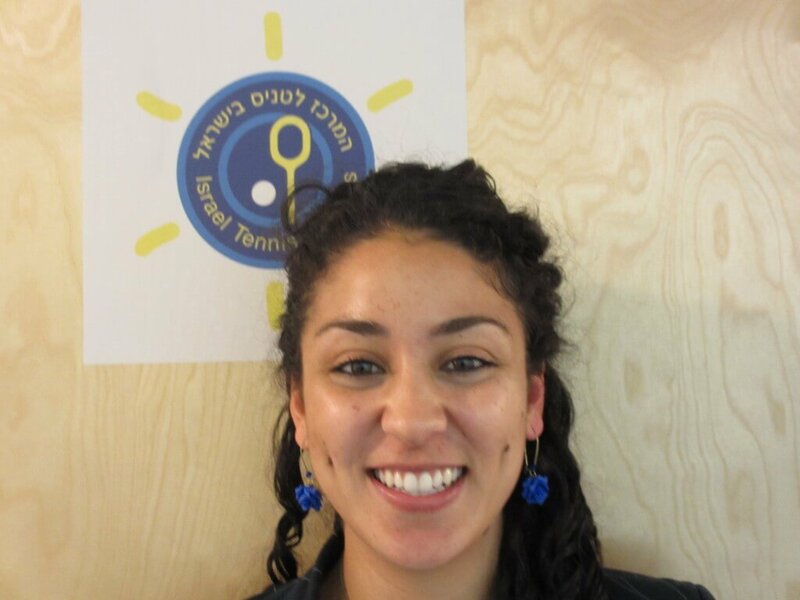 Now a development associate in New York for the Israel Tennis Center, Fahoum, who recently wrapped up her college career at Duke University, sees a promising future for her old partner. But while Glushko, who ranked as high as No. 10 in the world as a junior, appears to be on her way, challenges lie ahead — particularly financial ones. Following her match, the 5-foot-7 player spoke with the Times of Israel. An condensed excerpt appears below. What is it like representing Israel and Jewish people around the world? It is probably one of the most special things. There are not many athletes from Israel. I am thankful to be able to represent Israel at the US Open. For the women, it is only me and Shahar in the main draw. Do you think Israel can produce more top players? What are some of the challenges facing Israel? There are a lot of Israel Tennis Centers, and a lot of people who play, but it is hard because everyone goes to the army at age 18. Also, tennis is an expensive sport. The tennis centers work hard to raise money, but it is expensive — traveling overseas, a coach, etc. I pay for my travel, mostly from my prize money. This time, I raised enough money for my coach, Liran Kling, to come. There are ups and downs to playing tennis. You are away all the time. It is hard on your body — I have pain in my knees all the time. It is a hard life, but I love it. I feel lucky. I try not to think about [match results] or money — I just think about working hard and keeping healthy. What was your experience growing up? How did you get into tennis? I was born in the Ukraine and moved to Israel when I was 8. I feel so Israeli! I am happy [my parents] moved, because life in Israel is so much better. We lived in Jerusalem for three years, in [the Katamon neighborhood], near the tennis center, where both of my parents are teachers. I remember so clearly the first time I went to the Israel Tennis Center: It was at night, the lights were on and they let me play — and they coached me –for free. We moved again, to Ramat Hasharon, so I could play tennis there. I was home-schooled for the last few years of high school, then went to the army. Can you describe your army service? I served for more than two years. I was a sports mitstayen [an elite athlete allowed to continue her career as she completed her army service]. I did three weeks of basic training where I stayed on the base, learned how to shoot a gun and slept in a room with nine other girls. After that, I was able to come to my base whenever I was [not playing tennis]. Serving in the army is important to me: It is one of the basic things of the country — it is special. The country gives so much to me, so whatever I can give back, I want to give back. As his new album debuts, the renegade religious rapper tells The Times of Israel why he drastically changed his lifestyle. Sitting backstage at Matisyahu’s concert in Stamford, Connecticut five days before the July 17 release of his new album, “Spark Seeker,” his father Bob Miller is smiling. Warm up band Moon Taxi has left the stage (as part of the Summer 2012 “Alive@Five” Festival), the sun is going down, the Stamford Town Center is packed and the crowd is cheering. Matisyahu, best known for performing in traditional hasidic garb — black kippa with tzitzit (ritual fringes) swinging under his white shirt — is now dressed in a white T-shirt, black faded jeans, fashionable white sunglasses and green Nike sneakers. For most in the audience this is their first in-person look at his handsome, clean-shaven face. 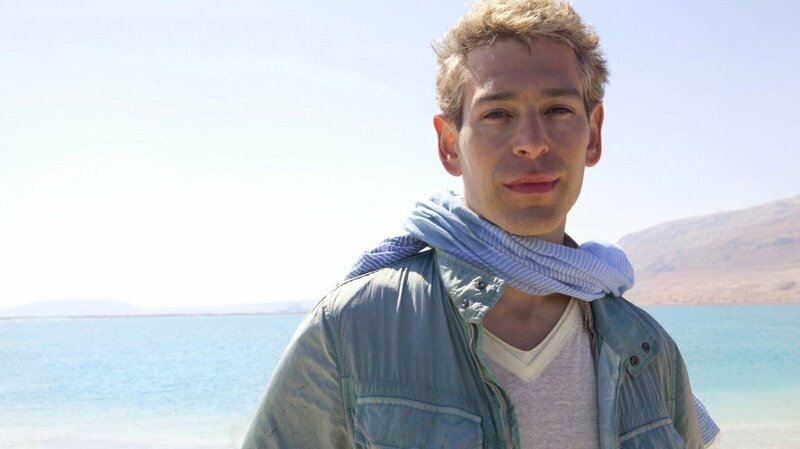 Matisyahu, born Matthew Paul Miller, no longer looks like a Lubavitcher. And he no longer embraces a hasidic lifestyle. On December 13, 2011, Matisyahu shocked the Jewish world by posting a beardless picture of himself on Twitter, with additional commentary on his website. Sorry folks, all you get is me… no alias. When I started becoming religious 10 years ago it was a very natural and organic process. It was my choice. My journey to discover my roots and explore Jewish spirituality — not through books but through real life. At a certain point I felt the need to submit to a higher level of religiosity… to move away from my intuition and to accept an ultimate truth. I felt that in order to become a good person I needed rules — lots of them — or else I would somehow fall apart. I am reclaiming myself. Trusting my goodness and my divine mission. Get ready for an amazing year filled with music of rebirth. And for those concerned with my naked face, don’t worry… you haven’t seen the last of my facial hair. Mother Rochelle was also backstage at the Stamford concert, along with their daughter and family friends which included Matisyahu’s fifth grade health teacher who danced with her former student on stage. Ms. Miller was happy that Matisyahu was performing a short 27 kilometer drive from their home in White Plains, New York. Rochelle enjoys the concert but shares more motherly concerns: The 33-year-old Matisyahu, wife Talia, and sons Laivy (7), Shalom (5), and Menachem Mendel (1), recently moved from Crown Heights, the world headquarters of Chabad Lubavitch, to the Pico Robertson neighborhood of Los Angeles, California. At first, Matisyahu reports, “I wasn’t necessarily interested in leaving,” but he soon realized, “I wasn’t tied to one place.” Matisyahu consented and the family relocated. Perhaps an additional benefit of living in Los Angeles is the proximity to Hollywood. Matisyahu will appear in the horror movie, “The Possession,” set to open August 21. Ironically, the now clean-shaven Matisyahu plays Tzadok, a rabbinic exorcist. The movie, which stars Kyra Sedgwick and Jeffrey Dean Morgan, is the story of a girl who buys an antique box at a yard sale and is unaware that an evil spirit lives inside. For Matisyahu, acting is a return to his second love — he reportedly always had a passion for acting and was in plays in college. 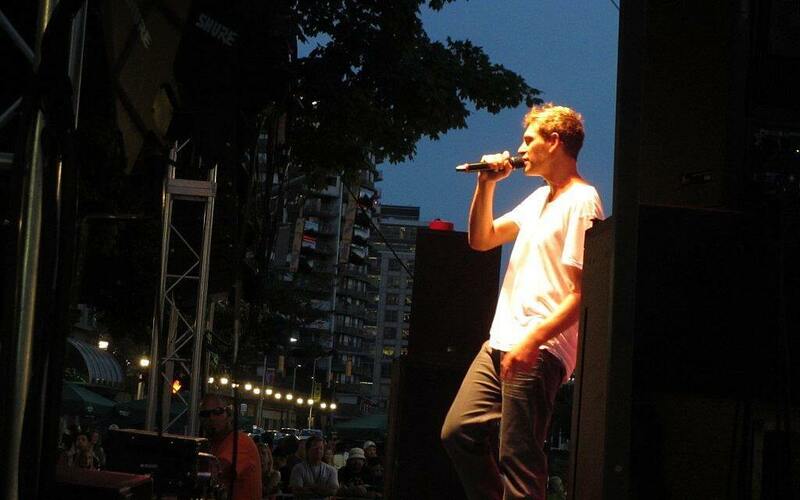 Matisyahu is still best known for his first love, music. 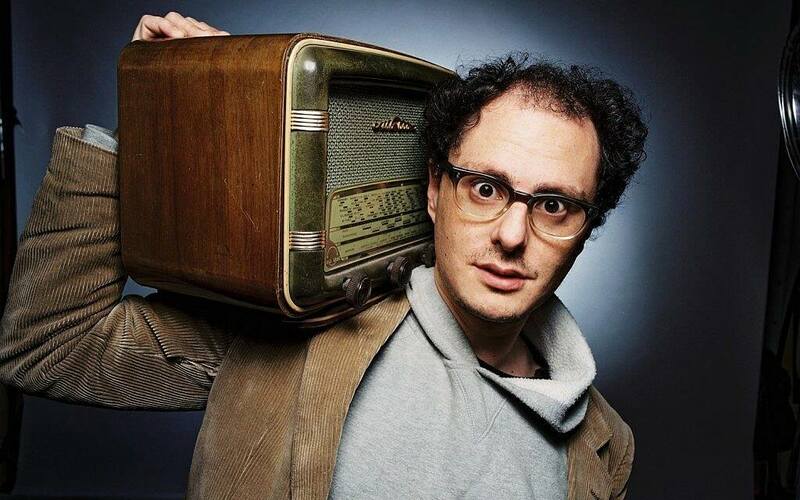 His musical styles include reggae, beat boxing and rap. His current tour, which ends on September 29, will take him and his band across the United States, Canada and Portugal. He continues to play such well known songs as “Jerusalem” and “King Without a Crown,” as well as cuts from his upcoming “Spark Seeker” album. Matisyahu spoke candidly with The Times of Israel pre-concert from the back of his van, en route from the Stamford Marriott to his tour bus outside the Stamford Town Center. The musician spoke openly about a favorite song on his new CD, his family, and his recent transformation. How is this different from past tours? Who is your audience? How is anything ever the same? I go for deep. I have a hard time answering simple questions. The audience is different. We are on tour with the Dirty Heights. It is a younger crowd. Your new CD “Spark Seeker” comes out on July 17. Are you excited about the release? Do you have a favorite song? Of course I am excited. I don’t have a favorite song but one I have been performing lately, we’ve been staring off our shows with and the one my record starts with is “Crossroads.” I don’t even remember recording it to be honest with you. And I don’t remember writing the lyrics, but I did feel that when I listened to it, especially after all the changes, and everything that has been going on — I just felt like that it really sums up a lot of what I was feeling. On “Light,” there was that line — “one tiny moment to shine.” [he is referring to the song “I Will Be Light.”] Looking back on the record, I feel like that was the main lyric of that record and I feel like “Crossroads” every night when I’m starting to sing it. I just feel like it’s perfect, I just feel like it’s right . Sometimes you write a song and it has a certain mood in it, and a feeling in it, and you are not always in that mood. Or that lyric doesn’t always resonate. The song that’s definitely resonating for me now is called “Crossroads.” And it feels powerful every night to go out and to perform it. How do you deal with life in the spotlight? I don’t know. How do you deal with it? It’s pretty cool. You change your appearance — that’s one thing! Do people not recognize you these days? Not even at my own shows! When I saw you at the hotel, I didn’t even recognize you. You were wearing blue gym shorts, a blue T-shirt and tennis shoes — you just looked like a regular basketball player. People always grow and change and that’s awesome. Why did you decide to make your religious transformation so public? How are you navigating your current level of Jewish observance on the road? It’s kind of a different thing for me now. There are certain things I am still holding on to strongly, like obviously not performing on Shabbos, not traveling on Shabbos. Kosher. Kosher has been easy for me in this run because we have a chef and he is a vegetarian and he cooks just for me. So that one’s like knocked off. So that’s that. Shabbos is Shabbos. Everything else, for the most part, I’m not holding myself to it in terms of the rule aspect of it. It is more about an ideal. Ideally I would like to put my tefillin on every morning and daven mincha and daven ma’ariv [two of the three daily prayer services]. And I would like to say brachos [blessings] and all these things. But I sort of stopped holding myself to it. It is a weight off now I do it when I have the time and it feels right. When I make the time, I am a little bit more accepting, a little more patient with myself maybe than I was in past years trying to fit in putting tefillin on with, like, in the morning when I had to be at a radio station at 8:30… There are so many rules in Judaism, and if you get into them and you get obsessed and you have the kind of life that I have, it can make you a very unhappy person. It can make everything complicated and more stressful than it needs to be, so I kind of loosened the knots a little bit. How was the transformation for your family? My one-year-old dealt with it. He had to get used to seeing my face. I think the first time I held him, he didn’t recognize me. But it was very quickly that he got it. I think they look in the eyes. And the feeling and the voice. Maybe more than anyone else my one-year-old son got it right away. No judgments, certainly from him. And then, my other two boys go to Chabad school (in Los Angeles), and I had to warn them and tell them that people might say stuff. We had to have a lot of conversations. I think it’s given them a whole new take on… everything, because they will want to know. That things are not as simple; life is a little more complex. It is not so clear. I’ve had to talk to my kids and explain that maybe that’s not so. Basically what I tell them is that no one can ever be sure of anything — and in this life, your teachers, parents, yourself — you can have your own ideas, your own opinions, intuitions feelings, etc., whatever it is. But never to be too sure of yourself, and never to be too sure of anyone because, at the end of the day, we don’t know. That was a new idea for them. But amazing conversations — me and my sons. Yidstock: The Festival of New Yiddish Music, running in Amherst, focuses on klezmer tradition – and innovationWoodstock 1969, meet Yidstock 2012. Back in the day, the Woodstock Music and Arts Fair in Bethel, New York, may have featured such acts as Jimi Hendrix, Jefferson Airplane and the Grateful Dead, but today’s Yidstock: The Festival of New Yiddish Music, running July 11-15 in Amherst, Massachusetts, will present a who’s who of musicians from the klezmer and Yiddish music worlds, on the grounds of the National Yiddish Book Center. The Yiddish Book Center grew out of the work of Aaron Lansky, a 24-year-old graduate student in Yiddish literature who, in 1980, learned that thousands of priceless Yiddish books that had survived Hitler and Stalin were being discarded and destroyed. American-born Jews were unable to read the language once spoken by their parents and grandparents. Lansky organized a national network of zamlers, volunteer book collectors, to save the world’s remaining Yiddish books. The Yiddish Book Center has helped ensure the preservation and rebirth of Yiddish language and culture. The 49,000 square foot center is home to more than 1,500,000 volumes of Yiddish books. More than 11,000 Yiddish titles are now available free of charge online through the Center’s Steven Spielberg Digital Yiddish Library, and undergraduate students interested in becoming the next generation of Yiddish language speakers and translators spend their summer learning Yiddish language, culture and history. Hankus Netsky, scion of a klezmer dynasty, one of the original klezmer revivalists, and founder of the Klezmer Conservatory Band, shares Rogovoy’s appreciation for the Yiddish Book Center. “The Yiddish Book Center exists because the mainstream world neglected, then discarded, Yiddish literature and everything else too. The revival and revitalization is a major triumph of the last 30 years — this festival celebrates that.” Netsky, who holds a PhD in ethnomusicology and is director of the Itzhak Perlman “Eternal Echoes: Songs and Dances for the Soul” Project (to be released in the Fall of 2012 on Sony), speaks passionately about the themes of “salvage,” rescue and revitalization (he will be performing with a group known as Hebrew National Salvage). 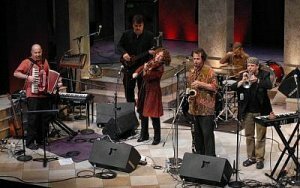 In a summer, 2011, PaknTreger article entitled, “But Is It Klezmer?” Rogovoy explores this latest wave of Jewish music, which continues to borrow from many sources. He playfully reports on the types of comments he hears when he exits concerts by performers like the ones who will play at Yidstock. Nadine Fahoum, a Muslim from Haifa, has become Israel’s unofficial ambassador off the court, and a phenom for Duke on it. For Nadine Fahoum, serving as an ambassador for Israeli tennis and the State of Israel is a pleasure — though anything but straightforward. The 22-year-old Muslim Israeli-Arab from Haifa recently graduated from Duke University in Durham, North Carolina, where she majored in business administration and received a certificate in marketing and management. While there she also found the time to rank number one in tennis singles and helped the Lady Blue Devils tennis team to a national ranking of number three. Her brother, Fahoum Fahoum, 20, has continued to follow in his sister’s footsteps. Fahoum currently studies economics and plays tennis at Old Dominion University in Norfolk, Virginia — the university Nadine transferred from to play tennis at Duke. Nadine and Fahoum have represented Israel in over thirty countries — starting with her first tournament in France at age 14 and including Switzerland, Portugal, Greece, and India. And they are not told what to say on behalf of the State of Israel. It has not always been easy. Many years ago, at New York’s JFK airport, security officials noted Fahoum’s name and asked to inspect her luggage. Coach Zohar intervened and said, “We are all the same — if you check her bag, you must check all bags. Check all or leave her alone!’” She was allowed to pass without inspection. Israeli security has subsequently invited Nadine’s mother to offer workshops to security personnel on how to treat minorities. Nadine recently began working as a development associate in New York City for the ITC. “If there were 10,000 Nadines, the [Israeli-Arab] situation would be different,” says Zohar. 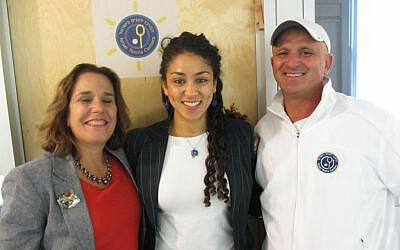 The Israel Tennis Center team: Jacqueline Glodstein, Nadine Fahoum and Shaul Zohar. “I’m sure there are — we just have to identify them and have them speak up,” adds Nadine. “We have to encourage them to speak up,” adds Jacqueline Glodstein, vice president of global development for Israel Tennis Center. Nadine has been living with Glodstein and her family in their Long Island home for the past six months. The family, whose members have all spent significant time in Israel, has found it very enlightening. Glodstein says, “We never had an opportunity to get to know on an intimate basis an Arab Israeli Muslim. It was an amazing opportunity for all of us. Living together, you just begin to know each other in a very special way — you create relationships and bonds.” The Fahoum parents also stayed in the Glodstein home for a e week during a recent trip to the United States.